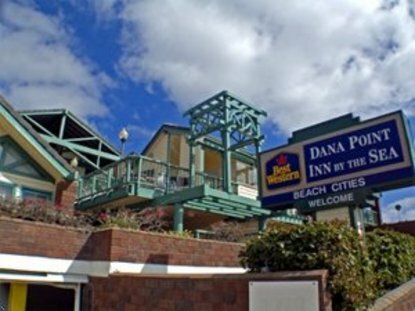 Nestled along the bluffs of beautiful Dana Point lies the quaint and charming 29-room Best Western Dana Point Inn-By-The-Sea. Situated along the white sands of Doheney State Beach, we invite you to enjoy breathtaking Pacific Ocean views from your private balcony or relax in the oceanfront hot tub atop our second story deck. We are conveniently located one mile south of Dana Point Harbor where you'll find numerous shops and gourmet restaurants. The ferry leaves daily to whisk you off to Catalina Island and just four miles north is the eclectic art community of Laguna Beach home to the Pageant of the Masters. All of our 29 newly decorated rooms are either oceanfront or have lush tropical garden views, some with their new own whirlpool tubs and fireplaces. Wonderful restaurants and great shopping are all within walking distance. We are a short distance to sailing, deep sea fishing, jet skis, whale watching, biking and rollerblading. Come experience all that southern California beach life has to offer.